Ann Lyddon kept in touch with her son Maverik through text messages while he studied biochemistry at Laurier’s Waterloo campus. But Ann didn’t text Maverik from the family home in Mount Forest. She texted him from the other side of the Science Building courtyard, while taking a break from her own studies as a Laurier student. 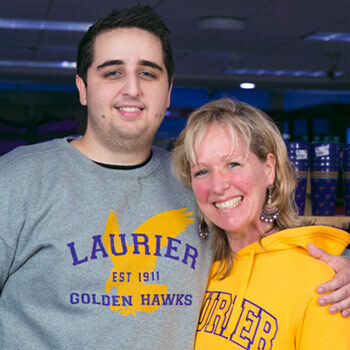 The week of June 12, Ann and Maverik will receive their degrees during their respective convocation ceremonies and join Laurier’s graduating class of 2017 together. Obtaining a bachelor’s degree had been a life-long dream for the 52-year old Montreal native. Ann, a substitute educational assistant, would like to teach English abroad, and studying languages helped her to further develop her skillset to teach English-language learners. Ann enrolled in Laurier’s general Bachelor of Arts program in 2014, focusing her studies on French- and Spanish-language courses. Despite previous post-secondary studies (she has a diploma from Conestoga College), returning to school as an adult student came with its challenges. Ann, who admits most 20-year-old young men may not want to run in to their mother on campus, is extremely grateful for the support and guidance Maverik provided – on and off campus. Besides offering regular reassurance, Maverik tried to school Ann on aspects of student life that were new to her – such as using a web-based course registration portal, and navigating an online learning environment. Maverik says having his mom attend university at the same time was, well, ‘interesting.’ His mom and his girlfriend were both students in the same first-year French class, something Maverik jokes about trying to keep from his mom. But knowing how difficult university academics can be from his own experience in the biochemistry program, he was happy to help his mom any way he could. Ann will receive her general Bachelor of Arts degree June 13 during the Faculty of Arts convocation ceremony; Maverik will receive his honours Bachelor of Science degree in Biochemistry/Biotechnology June 14. Ann, who recently completed her Consulting for Education - Teaching English as a Second Language to Speakers of Other Languages (ACE-TESOL) certificate, plans to travel to Asia after graduation to embark on her English teaching career. Maverik’s plans? He’s considering a graduate degree, but this one he will do on his own.